Check the links to see our thriving, dynamic community. The baseball tournament drawing was held at Louisville High School on Monday night. Stark County will have two Division 1 sectionals, with the winner of each advancing to the district event to be held in Youngstown. First round games will be played on Tuesday, May 2. Massillon will travel to GlenOak for their opener but, per tournament rules, the Tigers will be the home team. A win will match them against North Canton Hoover who, being the top seed in the tournament, drew a first-round bye. Massillon lost to Hoover earlier this season 4-3, but left 12 men on base. So you have to like our chances in the sectionals. Four teams will compete for advancement rights in the other sectional led by Jackson, the second-seeded team. They will face Canton McKinley. The other half of the bracket pits Perry against Canton Timken. Coach Tim Ridgley had an opportunity to place his team in the Jackson bracket, but felt otherwise. In both 1998 and 1999, the Tigers lost to Jackson in the first round and he would rather take his chances against Hoover. It's no secret that when the Tigers face GlenOak on Tuesday night they will have on the mound their ace pitcher, B.J. Budd. But that's not all. They will also field a batting lineup that is more potent than the Cleveland Indians, with four batters hitting over .400. Budd, a junior, started six games this year and has a record of 4-0 with two no-decisions. One was a contest against Canton McKinley that he didn't get to finish after taking a line drive off his pitching hand. In the other one, he pitched four innings against Norton and departed with a 4-0 lead only to see Norton tie it up in the top of the seventh and cost him the win. His best outing this year had to be the one against Walsh Jesuit, the defending Ohio Division 2 state champion. Budd fired a 3-hitter against the Warriors and held them scoreless, fanning eleven batters and walking only three. That game firmly established Budd as the Tigers' ace. Three other pitchers have played significant roles in Massillon's success and will probably be the first relievers in the game in the event Budd has any problems. Chris Swenson has a record of 3-0 and an ERA of 1.21 through 17-1/3 innings of work. Chris struggled in his first couple of outings but has now gotten it together and can be a very formidable pitcher to face. David Broome has started a few games lately and sports a 2.77 ERA through 17-2/3 innings. Broome will turn in a very consistent performance and has given up the second-fewest walks. Jason Savage has been an on-and-off starter and has also been used in relief. He struggled during the early part of the season but has become a much better pitcher down the stretch. With a record of 4-2, he has a strikeout percentage of 27%. A couple of other pitchers have also seen some action including Jason Abbott (2-0, 0.88 ERA) and Jim Barkan (0-1, 0.00 ERA). Abbott sports a team-high strikeout percentage of 38% and has delivered a few key punch-outs in critical times. Barkan has yet to surrender an earned run. The top of Tigers' batting order this year includes Todd Helline, Dan Ackerman, Chad Marceric, and Anthony Battle. This group has give opponents fits and boasts of a .424 combined batting average. Leading the attack with a .453 average is Battle, who always seems to hit at the right time. The leadoff batter in any lineup is supposed to be one who can find a way to get on. This role is filled by Todd Helline, with an on-base percentage of 51%. He also has a .447 batting average. Next up Dan Ackerman, whose job is to advance the runner. He bats .375 and often takes the ball to right field putting Helline on third. Ackerman also leads the team in walks. In high school ball the power hitters are located in the three and four spots and Massillon has two good ones there in Chad Marceric and Anthony Battle. Marceric bats .418 and has four doubles and a home run. Battle, with two doubles and a triple to his credit, has a team-high ten RBIs. But the hitting potential does not slack off after these two guys. Jason Savage bats 5th with a .410 average and catcher Charles Hendricks follows him at .390. The surprise of late is the bottom of the order: Jason Abbott, Ryan Ridgley, and Dan Melito. In the last three games they were 13 for 23 with five extra-base hits. With this performance they improved their combined batting average from .233 to .301. There's also some power there, with Abbott leading the team with seven doubles and Melito having a home run. With a tournament pitching duo ERA of 0.95, a batting lineup hitting at .377, and five seniors on the field, the potential for this team to advance is tremendous. All the players have to do now is go out and execute. NOTE: Rain dates are the following day of orginally scheduled game. The Golden Eagles were knocking at the door, but Jason Savage slammed it shut on them in Massillons 4-2 victory in a first round Louisville Division I sectional tournament game at GlenOak, Tuesday afternoon. With one out in the seventh inning, GlenOak had loaded the bases with a couple of hits and a walk. Savage came in to relieve starter B.J. Budd and struck out the next two batters to preserve the win. The Tigers will move on the face the Hoover Vikings next Tuesday in North Canton. Massillon coach Tim Ridgley was unsure at first about bringing in Savage, but was happy he did. "Here he is a junior pitching in his first sectional game, the bases are loaded, theres one out and he has to come in and get a couple of outs," Ridgley said. "What kind of pressure is that on a kid? He came through." GlenOak coach Joe Gilhausen was pleased with his teams comeback effort. "We told them before the ball game that we wanted to stay close and try to find a way to win it," he said. "We were in that position, but didnt get it done. To their credit our guys kept playing hard after things started going against us." Budd and his GlenOak counterpart Jim Waller kept the game scoreless through the first three innings, but Massillon struck in the fourth. Down to the final out of the inning, first baseman Anthony Battle laced a shot into right field. Charles Hendricks beat out a ground ball to move Battle to second base. Savage hit a line-drive single up the middle to score Battle. The Tigers engineered two more runs in the fifth inning, thanks in part to a costly GlenOak error. Ryan Ridgley walked to lead the inning off. Dan Melito beat out a bunt which put men at first and second. A Todd Helline bunt was fumbled by the Eagle first baseman, loading the bases. A Dan Ackerman single brought Ridgley home and Chad Marcerics sacrifice fly would plate Melito. GlenOak climbed back into the game with a two-run sixth inning. Matt McFarland opened the inning by blasting a pitch over the left field fence to make the score 3-1. Ryan Cavanaugh then reached on a tough error, and Rocco Milano doubled to the center-field fence to bring in Cavanaugh. Massillon scored its insurance run in the bottom of the sixth when Savage singled to right and moved to third on consecutive wild pitches. Jason Abbott singled to score Savage and make the score 4-2. Budd pitched 6Ïinnings striking out 12 batters. Wallers went the distance for GlenOak and struck out seven. "B.J. Budd pitched well," Tim Ridgley said. "Im happy for him. Im happy for our program." Gilhousen gave the Tiger pitchers credit for the win. "I thought their pitching was excellent," Gilhousen said. "We had a really tough time with (Budd) and (Savage) threw strikes and kept his composure. He got the outs he needed, so you have to tip your cap to them." Jim Waller and K.C. Saunders. B.J. Budd, Jason Savage (7) and Charles Hendricks. WP- Budd (6-0). LP - Waller (1-4). S - Savage. HR - Matt McFarland. Records: Massillon 14-3, GlenOak 6-11. PLAIN TWP.  And Tim Ridgley thought he was nervous. The head coach of the Massillon baseball team woke up at 5 Tuesday morning, almost in a cold sweat. His team, riding an 11-game winning streak, was playing GlenOak in a first-round Division I tournament game. The last two years, Ridgley watched his promising teams exit the tournament after just a game. So here he is, almost 14 hours after waking up, looking at the scoreboard. Massillon 4, GlenOak 2. But the Golden Eagles have the bases loaded and just one out, and their best hitter, Ryan Cavanaugh, is coming to the plate. Whats a coach to do? Ridgley and his pitching coach, Jerry Vance, huddled. They decided to take out fireball southpaw B.J. Budd, who had 11 strikeouts, and go with Jason Savage. And Ridgley thought he was nervous? He put the ball in the hand of a kid who was not too far from needing an IV. Savage, a junior, put all the thoughts of the previous two years out of his mind. It was the current ones that were getting to him. I was about ready to throw up, Savage said. And then he promptly struck out the next two batters to lift the Tigers to a 4-2 win and put Massillon in a sectional final game against North Canton Hoover. When he got the final out, I felt like the weight of the friggin world was off my shoulders, Ridgley said. It wasnt just the bases loaded thing, it was all day I was nervous. My stomach has been in a knot since I woke up. And so did Jason Savage. He threw just eight pitches, but they were the most important eight pitches of the season for Massillon. Before delivering his first pitch, Savage backed off the mound, put his hat over his face. He was trying to calm his nerves. And he did it the same way he does every time he pitches. Savage hides his face with his ball cap for about 10 seconds. He prays to his grandmother, who passed away in November. She was at all my games, Savage said. In a way, it is Savages way of bringing Grandma Lois Savages presence to the game. I miss her a lot, he said. When Savage pumped a slider out of the strikezone for the games final out, Massillons dugout erupted. Two of the first people to Savage were Ridgley and Budd. Through six innings, Budd allowed just five hits. When the seventh started, GlenOaks hitters were determined to come back. Ray Frisbee singled to left and went to second on Marico Smalls pinch-hit single. Budd struck out the next batter, but walked Matt McFarland, whose home run in the sixth accounted for Budds lone earned run. The Golden Eagles got a solid outing from freshman Jim Waller. Of the four runs charged to him, two were earned. He struck out seven in six innings. Waller is 1-4, but he has kept us in every game hes pitched this season, Gilhousen said. It was evident from the start the game would be a pitchers duel. Waller was throwing strikes and Budd was setting GlenOaks hitters up with his fastball and getting outs with his curveball, which is uncommon at the high school level. He is 6-0. So Massillon played Ridgley ball. The Tigers scored two crucial runs in the fifth to go up 3-0. Ryan Ridgley led off with a walk and Don Melito beat out a bunt. Todd Hellines perfect bunt between the mound and first loaded the bases. Ridgley scored on Dan Ackermans single to center and Chad Marceric brought home the other run with a sacrifice fly. And it came down to guts. Ridgley and Vance took a great deal of time to decide whether or not to relieve Budd. It was a tough decision. His pitch count was nearing its end, but GlenOak hit the ball hard just a handful of times. Yes the Tigers certainly did. Canton McKinley head coach Bob Neff sympathizes with the Jackson baseball team that his Bulldogs upset Wednesday night in a Division I sectional opener. The second-seeded Polar Bears (9-6) were a coin flip away from gaining the top seed at the tournament drawing and earning the first-round bye which goes with it. Jackson and North Canton each received three first-place votes and, in order to break the deadlock, the tournament director flipped a coin. North Canton won the toss, and Jackson lost to McKinley 3-2. It's about the only certainty in this rugged Louisville Division I sectional tournament. Bracket finals are set for Tuesday. And while there is plenty to analyze, flipping a coin might be the most reliable means of picking winners in the Perry-McKinley and Massillon-Hoover showdowns. Massillon is the hottest club heading into the sectional finals. The Tigers have won 12 straight, including 4-2 over GlenOak in a tournament opener. Head coach Tim Ridgeley has one of the area's top hitting clubs (Anthony Battle and Todd Helline are averaging better than .440) and a solid pitching staff led by left-hander B.J. Budd (6-0), who struck out 11 against GlenOak. But after being eliminated in tournament openers the past two years, Ridgeley knows how quickly a promising season can vanish. ``At this time of the year, it's about what can you do for me tomorrow, not what have you done for me lately,'' he said. One of the Tigers' losses came against North Canton 4-3. The Vikings, who qualified for the state finals last season, are coming off a productive spring break trip to Florida, where they played teams from New York, New Jersey and Ohio. Head coach Mel Long believes the trip properly prepared the Vikings (12-4) for the tournament. He is counting on one of the area's top pitching staffs, which includes seniors Mike Grady (3-2, 0.51 ERA) and Jed Allen (3-1, 2.93). Beau Barnes is hitting .458. The most productive pitcher in recent weeks has been Perry's Josh Mayle. The senior right-hander owns a 3-1 record with an 0.90 ERA and 40 strikeouts in 24 innings. Mayle struck out 10 in the 8-1 sectional-semifinal victory over Timken. ``Josh has been outstanding,'' Gamble said. ``He has been holding us in games.'' The Panthers (9-6) and Bulldogs (5-12) will stage a bracket-final preview of sorts tonight at Thurman Munson Stadium. Of course, neither coach plans to start his top pitcher. The Bulldogs' shocking win over Jackson was made possible by a gutsy 114-pitch outing from Steve Larson (2-2), who held the Polar Bears hitless over the final four innings. McKinley scored all three of its runs with two out in the sixth inning off ace John Redmond. The Bulldogs' offense has been led by sophomore Marcus Geiselman, who is batting around .500. McKinley has won four straight after starting 1-12. ``We've made some position changes and juggled our lineup, and it has paid off,'' Neff said. LOUISVILLE DIVISION II: One of the more intriguing sectional finals pits Louisville (16-4) and Central Catholic (16-5). The Crusaders have won nine of their last 10 games heading into the showdown. They have reached the district level six straight years. Louisville ace Jason Archer has a 1.77 ERA and has collected 28 RBI. Monday's other two bracket finals feature Marlington (10-10) versus Canton South (16-3) and Triway versus Orrville. 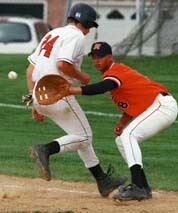 Jason Guth of North Canton is tagged out at second base by Tiger secondbaseman Todd Helline. The Massillon Tigers have gotten used to this last at-bat magic. For the seventh time this season, the Tigers won a game in their last at-bat, as they rallied for a thrilling 3-2 eight-inning sectional-championship victory over North Canton Hoover when Jason Abbott hit a deep fly ball to left field that allowed Jason Savage to score from first base with one out. Massillon, which will now play one of the two Youngstown sectional winners at Struthers next week, was the designated home team despite the fact the game was played on Hoovers home field. "Its better to be lucky than good at this time of the year," a visibly exhausted Massillon coach Tim Ridgley said. "But you have to put yourself in position to be lucky. All I ask is that they stay close and give us an opportunity to win it." Abbotts fly ball, which came off Hoover starter Judd Allen, appeared to have confused the Vikings left fielder, who started back tentatively before watching as the ball sailed over his head and all the way to the fence. "I hit a lot of balls like that," Abbott said. "I knew it was going to carry when it left the bat because I could see it rising." Ridgley wasted no time in sending the speedy Savage - who also got credit for the win after pitching two innings of relief - home to score the winning run, despite the fact he was on first base at the start of the at bat. "Jason stopped briefly at second," Ridgley said. "But I was sending him no matter what. They were going to have to throw him out at the plate." The eighth inning was one of the few times either team capitalized on the opportunities they were provided. Both teams had more than a few occasions to start a big rally, only to watch as the pitchers - either Allen for Hoover or B.J. Budd or Savage for Massillon - make a key pitch or get a big play from their defensive mates. Massillon stranded a total of eight runners on base, while Hoover left 10, including five in scoring position. The Tigers left six at either second or third base. "We left a lot of guys on base, and so did they," Ridgley said. "But Judd Allen is a heck of a pitcher and deserved to win that game.I didnt think B.J. had his best stuff. But he doesnt quit and really fought hard." After Hoover left the bases loaded in the top of the seventh, the Tigers had a golden chance to win the game in the bottom half of the seventh inning when the first three hitters all reached base on singles, the last two on bunt singles which they beat out. But Allen induced a fielders choice ground ball to shortstop, who threw home to cut down the lead runner, followed by a pair of pop-ups caught by the second baseman. The last pop-up came off the bat of Anthony Battle - whose home run just inside the left-field foul pole in the second inning gave Massillon a 1-0 lead - on a 3-1 count after the pitch prior appeared to be off the plate for what would have been ball four. "Todd Helline was on second base and said it was six inches off the plate," Ridgley said. "But (the umpire) called that pitch all day." Hoover opened up the sixth inning with a sharp grounder by Sam Simmerman to short, which was hit too sharply for the shortstop to handle cleanly to allow Simmerman to reach safely. Simmerman was lifted for pinch runner Nate Daugherty, who went to third when Budds pick-off throw went by the first baseman. Doug Yoder followed Simmerman by hitting a grounder to third, but the throw was a little low and Battle could not dig it out in time for the out to leave runners at the corners with no out. Yoder was lifted for a pinch runner, John Hemric, who stole second base. Budd settled down to record a strikeout and a flyout to the outfield. But Allen laced a single to right field that scored both base runners to make it 2-1 Hoover. In bottom of the sixth, Chad Marceric led off with a solid single and moved to second on a perfect sacrifice bunt by Battle. After a fly-out made it two outs in the inning, Savage ripped a hot shot back up the middle that was misplayed by the second baseman before rolling into center field, allowing Marceric to score. Judd Allen and Sam Simmerman. B.J. Budd, Jason Savage (7) and Charles Hendricks. WP - Savage (), LP - Allen (4-2). HR - Massillon: Battle. Records: Massillon 16-5; Hoover 14-7. NORTH CANTON  Sometimes there are perfect days. When the sun is shining and the air is thick. During the high school baseball tournament, there is no better feeling than to know there will be a tomorrow. There are boys on a field playing baseball, a boys game on a boys day. Around 7 oclock Tuesday night, there was a four-foot pile of boys, arms flailing, knees kicking. They were pounding on one another in a good-natured way. Those kids from Massillon High School were having the time of their lives. On the bottom of that pile was Jason Savage and Jason Abbott. They were the heroes in the Tigers 3-2 extra-inning sectional final victory over North Canton Hoover. Behind Abbott, Massillon head coach Tim Ridgley was talking with reporters. His players sneaked up on him, with a large bucket of ice water. They dumped it over the unsuspecting coachs head. Abbott, a left-handed hitter, drilled a line-drive double over the left fielders head with one out in the eighth inning. Savage, who reached first with a walk, raced all the way home with the winning run. A second after he touched home plate, his teammates were there to celebrate the win. They rolled and frolicked in the dirt. 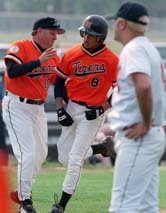 Yes, this was a great day to be a kid in a Massillon baseball uniform. The friendships the Tiger players have built through the years does not start and stop on the diamond, either. There was a sense of shock near the Massillon dugout. Ridgley was clearly still surprised at the win. He was not surprised that his team, rather how the Tigers did it. Savage was on first base when Abbott came to the plate. Abbotts hit looked like it would be an out, but the ball kept carrying. Once it hit past the outfielder, it rolled another country mile to the fence. Usually, there are telltale signs when a team might lose a game. Errors and wasted scoring opportunities. Both struck Massillon at the worst times. With a 2-0 lead, the Tigers committed four errors in the sixth inning. That allowed Hoovers Sam Simmerman and Doug Yoder to score thanks to a clutch, two-out, full count single off the bat of pitcher Judd Allen to tie the game. But in the seventh inning, Massillon looked like it was going to strike back, and strike hard. Ryan Ridgley led off with a bloop single to right field. Dan Melito followed with a bunt single, as did Todd Helline. There they were: Bases loaded, no outs in a tie game in the last half of the seventh inning. The Tigers did not score a run. The inning ended in controversial fashion. Anthony Battle had a 3-0 count. One more ball, and the winning run would have crossed the plate. The fourth pitched appeared to be high and outside, but it was called a strike. Battle eventually popped out to end the threat. Both teams were looking for charity. They combined to strand 20 runners. But a lot of that was due to the superb pitching performances. Allen, North Cantons starter, took the tough-luck loss. When he gave up the game-winning hit, he was nearing his pitch limit and was going to be relieved. Allen pitched seven innings and scattered 10 hits. He struck out five. For the second straight tournament start, B.J. Budd put Massillon in position to win. Budd went six innings and gave up four hits. Both runs were unearned and he struck out five. Savage picked up the win in relief. He worked out of jams in the seventh and eighth innings. But he still had enough gas left in his tank to score the game-winning run from first base. We had opportunities, and they had opportunities to win it, Ridgley said. I just thank God we won it. All you had to do was look at the mass of elbows, arms, knees and legs rolling around in the dirt near home plate. Those kids from Massillon were having fun. MASSILLON -- It takes horses to win a derby. It takes luck. It takes attitude. It takes fans. Those three combine to form a special aura. And right now, the Massillon Tiger baseball team has all of it. During Tuesdays sectional championship game against North Canton Hoover on the Vikings own field, there were more Massillon fans in the park. Massillon fans never cease to amaze me. You have to hand it to the Massillon folks. They support their high school (fill in the blank) team, especially a winner. A group of Massillon students loaded up a couch and brought it to Hoover. The couch, officially titled the Home of the Village Idiots did not make it in the stadium. But their spirit never died. During the game, one crazy but well-intentioned kid sneaked up on top of Hoovers dugout and stole a fake lobster the team had placed there for good luck. Massillon fans erupted when the Tigers scored the winning run in the bottom of the eighth inning. It was reminiscent of the state title run the Massillon baseball team put together in 1994. And that brings us to the rest of what it takes during the baseball tournament. We know it takes horses. Massillon manager Tim Ridgley thought he had that when the season started. Any coach still playing in the tournament will tell you he would rather have too much luck than too much talent. In case you havent heard, luck will win $350 million. Talent cant do that. The best part about this time of year is watching the talent, the luck, the fan support all come together to make the aura. Massillon had it in 94. Last week, the Howland team golfed together and then ate dinner. Massillons entire team has gone out several times this season. But that unity is not something that is created overnight. By his own estimates, Ridgley said his players have been in about 400 games in the last four years between high school, summer and fall baseball leagues. 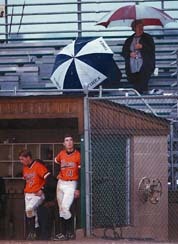 You could sense something special was taking place in the Massillon dugout Tuesday night. It was the same feeling the 94 team garnered. Now, thats not to say this years team has a spot in Columbus, but the same feeling was there. It has been like that most of the season for Massillon. The Tigers have won seven games in their last at-bat. Not only does that breed success, it breeds confidence and a feeling they can win regardless of the circumstances. That is why so many Massillon fans find it enjoyable to watch these kids play baseball. Ridgley has built more than a team in Massillon. He has put together a family. That, folks, is more important than any win or loss during the next couple of week for Massillon  or anyone else. They do not have much in common. That depends, though, on whether you are counting that both their names look like 50-point words on a Scrabble board. They do have scrappy baseball teams. They did not know anything about their next opponents, much less who they would be. The head baseball coaches at Howland and Boardman high schools were still savoring their sectional championships this week. Theyre just glad to be here. You can bet that will change over the weekend as Howland manager Chuck Potashnik and Boardmans Dave Smercansky inch closer to their district semifinal games. Howland will play Massillon, while Boardman takes on Perry Tuesday at 4 p.m. at Cene Park in Struthers. Massillon advanced to the district tournament after its 3-2 eighth-inning win over North Canton Hoover on Tuesday. Perry rode the right arm of pitcher Josh Mayle to a 2-0 sectional championship over McKinley. What about these teams from Trumbull and Mahoning counties? We will offer you a closer look at the two Struthers District teams. Of the two teams, Howland  also nicknamed the Tigers  appears to have the stronger of the two. At least on paper. The Tigers beat Warren Harding 8-0 to advance. Howland, 11-5, is a solid team defensively. Massillon will face the Tigers No. 1 pitcher Tuesday. They will throw junior right-hander Matt Hundley, who is 4-1 with a 1.88 ERA. He has four complete games and has struck out 46 in 33 innings. His brother, Jeffrey, is a southpaw in the Anaheim Angels organization. Hundley throws around 84 mph, according to his coach. Potashnik said several professional and college scouts have been tracking Hundley. Howlands last trip to the state finals was in 1958. 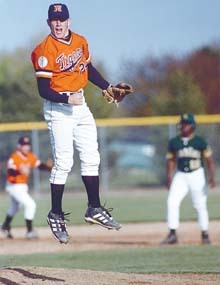 The Tigers made it to the district finals in 1998. Offensively, Hundley leads the way as well. When he is not pitching, he covers a lot of ground in the outfield. Most pro and college scouts are looking at him as a center fielder. Hundley is our leadoff batter, and he has some wheels, Potashnik said. Left fielder Brad Moore is hitting .353 and leads the team with seven home runs. Kyle Moore is at third base, and he is at .475, tops on the team. The cleanup hitter is Nick Setting. He is not the typical power hitter in the four spot, but he hits line drives. If Hundley gets into trouble, Potashnik will go with either Setting or Ron Hooper. And the odd note about Howland? Prior to coaching at Howland, Potashnik was in charge at Southington High School. If youre racking your brain because youve heard that name, it is the former Ohio home of boxer Mike Tyson. The Spartans are not entirely an unknown. There has been talk that Boardman would like to join the Federal League. Well, the Spartans have played three Federal League teams this season  a doubleheader against North Canton, Jackson in the Carnation Classic and GlenOak the first week of the season. Boardman is 14-8-1, but half of those losses came against Federal League schools. Here is the thing about the Spartans: They smack the baseball all over the park. They are hitting .354 and beat favored Austintown Fitch 14-2 in the sectional championship game. Boardmans No. 1 starter is senior Zach Orr. He is 5-3, with the three losses to GlenOak, Ursuline and Jackson. In 50 1/3 innings, he has 51 strikeouts and a 3.20 ERA. Most likely, the Spartan hitters will not be off balance. Andy Capraruolo is hitting a team-high .465 and is second with four home runs. He has a .789 slugging percentage. Hes a little turd, but he can turn on the ball and hes lightning fast, Smercansky said. The No. 4 hitter is Matt Sammon. He has a .368 average. Sammon was Boardmans starting quarterback until he tore ligaments in his knee. He lost some of his power, but he hits for average now. Todd Spencer, in the three hole, has a .394 average. The shortstop has six homers, tops on the team, and he is Smercansky No. 2 pitcher. Do not let the record deceive you. In 1991, Smercansky took Boardman to the state championship game and lost to Cincinnati Fairfield. When the tournament started, the team had an 11-11 record. They were in the regional finals in 1997, but lost to Cleveland St. Ignatius 1-0. You have to have talent, but at this point you have to have luck, too, Smercansky said. The odd note about Boardman? Smercansky went to Poland High School, one of Massillon football coach Rick Shepas stops before landing in Tigertown. He also graduated from Youngstown State University, Shepas alma mater. At YSU, Smercansky was a teammate of former San Diego Padre pitcher Dave Dravecky. Smercansky, a pitcher, was drafted by the Expos, but his career was cut short due to a rotator cuff tear. B.J. Budd continues to blossom as a high school pitcher. In Tuesday afternoons Struthers Division I district semifinal game against Howland, Budd was masterful in handling the opposing batters. He pitched hitless baseball the first five innings before settling on a three-hit shutout in a 7-0 Massillon victory at Cene Park. "B.J had great command, especially with his slider," said Massillon pitching coach Jerry Vance. "Weve been working with him on that slider the last couple of weeks. "B.J. just keeps improving. He did a great job in this game hitting his spots." Budd, a 6-foot-2, 215-pound junior who improved his record to 7-0, walked only one batter while striking out eight. "My overhand fast ball was pretty mediocre, but I thought I threw my curve, sidearm fast ball and slider well," he said. The Tigers, who improved to 20-6 and are scheduled to meet neighboring Perry for the district championship at 6 p.m. today at Cene Park, staked Budd to a 6-0 lead after three innings. Instead of losing concentration with a big lead, Budd continued to pitch with the mindset that his team was locked in a tight struggle. "I think its easier to pitch with a big lead," Budd confided. "I clear out all the (screaming) voices and just concentrate on the catchers target and just keep thinking one pitch at a time." Massillon manufactured the only runs Budd needed in the last of the second inning. Jason Savage, who is expected to get the starting pitching assignment against Perry, hit a soft line drive single to left-center to start the inning. On a hit-and-run play, left-handed batter Jason Abbott slapped a single past third and into left field, with Savage taking third. With one out and Dan Melito at the plate, Massillon coach Tim Ridgley called for the suicide squeeze. Melito, the No. 9 batter, bunted the ball on a line near the first-base line. Howland first baseman Craig Bush made a diving attempt at the bunt, but it landed on the ground as Savage scored. Bush recovered and threw to first, but Melito beat the throw for a bunt single. The ball got away from the second baseman and Abbott zipped home with the second run. "That bunt by Dan was big," Coach Ridgley said. "It gave us a lead. "Our goal (each game) is to get the lead early. I think our team plays with more confidence when we get the lead." With Budd mowing down the Howland hitters, the Tigers didnt appear to need any more runs. However, Massillon continued its offensive assault in the last of the third inning. Dan Ackerman singled, Chad Marceric was hit by a pitch and Anthony Battle walked, loading the bases. Charles Hendricks then singled home two runs. Abbott singled in another run and Ryan Ridgley capped the four-run outburst with a suicide squeeze bunt. "At that stage of the tournament, you have to be able to bunt," said Tim Ridgley. The Tigers used their speed to score their final run in the last of the fourth inning. Todd Helline singled, stole second and went to third on a throwing error. Ackerman lifted a sacrifice fly, completing Massillons scoring. After that, it was Budd and the Massillon defense that protected the shutout. Bush broke up Budds no-hit bid with a one-out single in the sixth. Matt Hundley, Howlands starting pitcher added another single, putting runners on first and second with one out. Faced with his first pressure-packed situation, Budd responded with a strikeout for the second out and center fielder Ryan Ridgley hauled in a drive that was headed toward the left-center field gap. Nick Setting led off the Boardman seventh with a single, but was erased on a double play grounder to third. Marceric fielded the hard hit ball, whipped the throw to Helline at second and Battle hauled in the relay throw. Budd then fanned the next batter, ending the one-sided match up. "This was as good as weve played all year," Coach Ridgley said. "B.J. pitched a great game. We made some good defensive plays and we manufactured some runs." And that execution added up to Massillons third tournament victory of the 2000 season. Matt Hundley and Corey Lewis. B.J. Budd and Charles Hendricks. WP - Budd (7-0). LP - Hundley (4-2). STRUTHERS  Sometimes the gods of intrigue defy logic. Why else would two teams from Stark County get in busses today for an 80-mile drive to play a high school baseball district championship game? Because it is an intriguing matchup, thats why. And also, the gods love drama. So at 6 p.m., two high schools that have dragged each other through controversy for the last year and a half will lock horns on the diamond. As if you need to read another Massillon-Perry story, right? Well, this one has nothing to do with recruiting allegations, football, attorneys, judges or athletic commissioners. Pure and simply, its just baseball. The Tigers thumped Howland 7-0 Tuesday at Cene Park in a Division I district semifinal. Meanwhile, a few hundred feet away, on Cene Field No. 2, the Panthers managed an 8-inning 5-4 win over Youngstown Boardman. Deep down inside, where they can only talk to themselves, neither head coach probably wanted to play the other team today. They, for sure, know about the rivalry and the recent bad blood between the two schools. But perhaps Massillon head coach Tim Ridgley put the game in perspective better than anyone. The Tigers were not too far from perfect against Howland, which is precisely how teams with an eye on the state tournament must play this time of year. Left-hander B.J. Budd delivered his best performance of the season. The junior kept Howland hitters off balance for seven innings. He took a no-hitter into the sixth inning before a single found its way into right field. Of the first 17 batters he faced into the sixth inning, Budd sent 15 back to the dugout. One of the two who did reach base got on thanks to an error. He struck out seven. Most impressively was the way Budd continued to nibble on the outside part of the plate  with a curveball. Vance and Ridgley tossed around the idea of taking Budd out of the game when it was surely in hand. Massillon led 7-0 after four innings. Taking Budd out might have given him enough rest to pitch again today. The operative word is might. Availability of the ace in the rotation is something Perry will not have today. The Panthers started Josh Mayle, and he had a one-hitter through five innings. Mayle was superb until the bottom of the seventh inning, and after that he wasnt bad by any means. In the seventh, Perry had a 3-1 lead, thanks to a two-run home run off the bat of Steve Piero in the first inning. Boardman mounted a comeback. Kris King crushed a Mayle fastball more than 400 feet for a two-run homer to tie the game at 3. In the eighth, Eric Heinzer led off with a walk. Jordan Henning followed with a bloop single inside the right field line. With two strikes, pinch-hitter Anthony Ranalli laid down a bunt to advance both runners. Leadoff batter Bryan Gamble then executed a suicide squeeze with Heinzer trucking down the third base line. Boardmans misplayed the bunt, and Perry scored two runs. Between Massillon and Perry, they combined for a half-dozen successful bunts Tuesday. The Tigers scored their first two runs thanks to a suicide squeeze. Jason Savage and Jason Abbott started the second with back-to-back singles. Savage landed on third base, and Abbott swiped second. Ridgley, sensing blood, went for the kill. He had designated hitter Dan Melito lay down a suicide bunt, which was misplayed. The Tigers got to two runs. Massillon tacked on four more runs in the third inning. Dan Ackerman singled, Chad Marceric reached base when he was hit by a pitch and Anthony Battle walked to load the bases. Charles Hendricks delivered a two-run single for the Tigers. Abbott smacked another single to score Battle. Ryan Ridgley laid down yet another suicide squeeze to score Hendricks. I like playing that way because it puts pressure on the other team, Tim Ridgley said. Massillon added another aggressive run in the fourth. Todd Helline singled, stole second and third bases. On his way to third, the throw from the catcher sailed into left field, and Helline, a bit winded, trotted home. Budd, in the meantime, kept setting down Boardman batters. Even when his no-hitter was broken, the southpaw refused to be rattled. The Panthers did not have quite as relaxing a day. Massillon made the 90-minute trip in a chartered bus Ridgley promised them. They watched For the Love of the Game during the bus ride. Perry came to town in a yellow school bus, sometimes not the most comfortable mode of transportation  not to mention their lead was threatened in the seventh and eighth innings. With a 5-4 lead, and the tying run on third, Boardmans Matt Repec hit a shot to left-center field. And today, Piero said he and his teammates will be anxious to get a crack at Massillon. It seems only Mother Nature can pour cold water on the heated Massillon-Perry athletic rivalry. A downpour hit Bob Cene Field in the bottom of the third inning of Wednesdays Struthers Division I district championship baseball game, forcing the contest to be suspended with the Tigers holding a 3-1 lead over the Panthers. The game will be restarted today at 6 p.m. with Massillon at bat. There were runners on second and third base with two outs and the Tigers No. 5 hitter Charles Hendricks at bat when the game was stopped for the second and final time of the evening. But there were some fireworks in those first three frames as Perry coach Frank Gamble and Massillon coach Tim Ridgley exchanged words in the middle of the second inning moments after Gamble approached the home plate umpire with a complaint. "There was a lot of chatter between the teams," explained Ridgley, "and Frank was making sure we were directing it at our own guys. It just got a little heated, thats all. "Because of everything that has gone on between the two schools, prior to the game the umps warned us both to make sure we took care of our own guys and no jabbering back and forth. I dont understand why Frank was upset because there was nothing going on. He wanted to make sure our guys were talking to our guys." Perry jumped out to a 1-0 lead in the top of the first when Brian Gamble led off with a walk and Steve Piero reached on a check-swing single to right field. Both runners moved up on a passed ball. After Tiger starter Jason Savage retired the Panthers three-hole hitter on a pop-up, clean-up man Josh Mayle hit a fly ball to right field that was deep enough to get Gamble home from third base. Savage got out of the jam without further damage by inducing the next hitter to pop out to shortstop Dan Melito, stranding Piero at second base. Massillon came right back in the bottom of the first to tie the game and then take the lead. Todd Helline walked on a 3-2 count, and promptly stole second base. Dan Ackerman then bounced a single up the middle that didnt reach the outfield but advanced Helline to third base. With runners at the corners and Chad Marceric up, Perry tried to execute a play but miscommunication foiled the plan. As Ackerman broke for second base on the first pitch to Marceric, the Panther catcher received the delivery then threw the ball quickly back to the pitcher, hoping to induce Helline to break from third. But the pitcher ducked out of the way of the throw, which landed in front of the shortstop and slithered under his glove, allowing Helline to score from third to tie the game at 1-1. Ackerman advanced to third on Marcerics ground out to short, then scored when Anthony Battle hit a sacrifice fly ball to right field, making it 2-1 Massillon after one inning of play. Catcher Eric Heinzer led off the Perry second with a single up the middle but was erased trying to swipe second. That proved to be a big play as Jordan Henning drew a walk two pitches after the caught stealing. Panthers starter Brandon Villilo retired Massillon in the second with the aid of Heinzer, who gunned down a Tiger trying to steal second after a one-out walk. Perry went down quickly and quietly in the top of the third but Massillon did not return the favor in the bottom of the frame. Melito walked to lead off and Helline dropped a bunt single in no mans land in front of the plate to put two on with none out. After Villilo got a strike out, Marceric hit a clean single to left field, scoring Melito. Helline advanced to third on the hit and Marceric took second base with some aggressive base running. One out later the heavens opened up and the field quickly became unplayable. STRUTHERS  Now it is time to scratch our heads and do the math. Perry and Massillon  two high school baseball teams less than five minutes apart  will have traveled nearly 1,000 miles between them to win a district championship. They could load up in the same bus and go to South Carolina for that kind of mileage. Ohio High School Athletic Association officials with more than 100 years of combined athletic administration experience and more than 40 years of college training made that decision. Wednesday night at 7:31, the Division I district title game was suspended in the bottom of the third inning with the Tigers batting. Massillon had a 3-1 lead with runners on second and third and two outs before the heavens opened and turned Cene Park into swampland. The game will resume at 6 p.m., at the point at which it was suspended. So, both teams loaded up their busses and headed back home. They get to look forward to another 90-plus minute ride to Struthers today  their third in as many days. Roundtrip mileage for both teams will total almost 960. I dont care about the miles. Weve just got to get our act together and play better baseball, Perry head coach Frank Gamble said. The stoppage of play may have seemed to give the Panthers a bit of an edge. Another base hit by the Tigers and Perry would have been down 5-1. Another days rest puts Perry ace Josh Mayle closer to pitching. Hey, were still in the tournament aint we? Gamble said. Players from both teams were upset the game was suspended. A handful of Massillon players even offered to help rake the wet field when it was learned there was no grounds crew to take care of the field after the rain started. Massillon head coach Tim Ridgley shrugged his shoulders when asked if either team had an advantage. Ridgley and Gamble, who are friends off the field, had a heated exchange of words with the homeplate umpire standing between them after the top of the second. Eventually they parted ways, but the crowd, which was at least 2-to-1 in favor of Massillon, got into the action a little more. Both coaches declined to comment on what was said or why. Struthers officials brought extra police to the game for added security. Other than the rain, there were no problems. It took two days to finish one baseball game, but the Massillon Tigers refused to allow an early lead to slip away. With Jason Savage in command on the mound and the offense manufacturing enough run support, the Tigers went on to defeat the Perry Panthers 5-1 at Cene Park to win the Struthers Division I district championship. "It was tough to come back and resume the game, but Jason Savage just went out and pitched a great ball game," said Massillon head coach Tim Ridgley. When a cloudburst opened up in the last of the third inning on Wednesday evening, the Tigers were leading 3-1 and had runners on second and third base with two outs. Perry head coach Frank Gamble took a chance, opting to pitch Moe Elum instead of Brandon Villilo, the starting pitcher when the game began and who was still on the mound when the downpour hit Cene Park. Gambles move paid off. Elum came in and recorded a strikeout, allowing Perry to stay within two runs. "That was a big strikeout," Gamble said. "If Massillon gets a hit, they could have broken it wide open." While Massillon failed to plate those two runs in that inning, Savage never allowed Perry to regain any momentum in recording the complete-game victory. "Jason Savage pitched a great game," said Gamble. "Massillon deserved to win." Savage, who recorded his sixth win in eight decisions, finished with a five-hitter, walking five and striking out six. "My slider was working real well," said Savage. "My defense also made some fine plays behind me." The Tigers turned one double play and catcher Charles Hendricks gunned down two Perry runners trying to steal. "Thats the type of team we are," Savage said. "We dont have one individual. Everybody picks one another up." It was a route-going effort that almost never happened before the game resumed. Ridgley confided he was considering going with another pitcher when Perry came to bat in the top of the fourth. "We had (Jason) Abbott warming up in the bullpen," said the seventh-year Massillon coach. "We were debating on bringing him in to start the fourth, but we decided to stay with Savage and let him pitch with a two-run lead and see what he could do." In the top of the fourth inning, the Panthers posed their first of two scoring threats after the game was resumed. Josh Mayle singled sharply to right-center leading off the inning. Glen Schering sacrificed Mayle to second. Following a strikeout, Matt Miller beat out a slow roller to shortstop, putting runners on first and third. With the go-ahead run at the plate, Savage got out of the jam by recording the third out on a pop fly to shortstop Dan Melito in short left field. "Massillon," Gamble said, "did a much better job manufacturing runs than we did." The Tigers, who improved to 21-6, had the leadoff batter reach base in five of the six innings they batted. That leadoff batter scored in four of those innings. In the last of the fifth, Massillon added to its lead. Melito walked, moved to second on a sacrifice bunt by Todd Helline and scored on a double down the left-field line by Dan Ackerman to make it a 4-1 game. "I wasnt thinking about the score at that time or how important that hit was," said Ackerman, who had a pair of hits. "I just knew we had to go out and keep playing good defense and take it one pitch at a time." That was sound thinking, since Perry staged its last serious scoring threat in the top of the sixth inning. With two outs, Schering singled sharply to left and proceeded to steal second. Eric Heinzer then walked, putting runners on first and second, bringing the potential game-tying run to the plate. Ridgley never made a move. Savage was staying in the game. Rising to the challenge, Savage got the next batter on a dribbler to the mound, retiring the side and Perrys last serious scoring threat. In the last of the sixth inning, Massillon made it a four-run difference. Hendricks singled to left and moved to second on Abbotts line-drive single to center. Ridgley then removed Hendricks for pinch-runner Chris Franks. With two outs, Melito delivered a run-scoring single to center, completing the scoring. "We like to put pressure on people," Ridgley said. "Well steal bases or hit-and-run. Its a lot easier scoring from second base on a base hit than from first base." Perry, which dropped to 15-10, received some effective relief pitching from Elum. In 4Ï innings, he allowed only two runs on five hits while striking out six. "Moe Elum did a fine job for us," Gamble said. "He allowed usch lost to Perry in a regular-season game, advanced to regional play with an 11-6 pounding of Upper Arlington in a Columbus district final, Thursday. Brandon Villilo, Moe Elum (3) and Eric Heinzer. Jason Savage and Charles Hendricks. WP - Savage (6-2). LP - Villilo (2-1). STRUTHERS  For two days, it hung over the heads of the Savage family. It was the kind of feeling you get the night before a root canal. Their son, a junior pitcher at Massillon, had a baseball placed in his right hand by Tiger head coach Tim Ridgley. Savage was given a task  win a Division I district championship and put Massillon two more victories away from the state semifinals. You were not in Jason Savages shoes. You do not know the circumstances. You have no idea how much pressure he put on himself to win this game. His family did. And that is why Savages father was down on the field after the Tigers beat Perry 5-1 Thursday night to advance to the regional tournament. Massillon will play Dublin Coffman a week from today at Thurman Munson Memorial Stadium. While Savage and his father were embraced in a warm hug and wiping tears from each others face  it was the kind of moment only a father and son can share  Ridgley was being drenched with the celebratory bucket of ice on his head thanks to Dan Ackerman and Anthony Battle. It meant a great deal to Savage  and Massillon fans  to finally beat Perry in a game that mattered. A year and a half ago, Savage left the Perry school system and enrolled at Massillon. Two other teammates, Dan Melito and Jason Abbott, followed him shortly after. All three started against their former team Thursday. The game started Wednesday night at Cene Park, but rain suspended it in the bottom of the third inning, which is where it picked up Thursday. Ridgley and pitching coach Jerry Vance talked about pitching Abbott instead of Savage. They both know Savage has a tendency to be nervous in the first inning of a game. The Tigers, at this point, could not afford to have him nervous in two innings, thanks to the restart. But then, what did Massillon really have to worry about with Savage on the mound? He is the same kid who came in to pitch against GlenOak in the first tournament game of the season. It was the last inning, and GlenOak had the bases loaded. Savage got the final outs, and the Tigers were well on their way to making their second state tournament run under Ridgley, who said this is just the fifth time in school history the baseball team has advanced to the regional tournament. Savage struggled in Wednesdays first inning. Massillon got into trouble in the first inning, but the damage could have been worse. The first two batters of the game for Perry, Bryan Gamble and Steve Piero, reached base on a walk and a check-swing single, respectively. After a passed ball, the Panthers had runners on second and third with no outs. Gamble scored on a sacrifice fly to shallow right field off the bat of Josh Mayle, which was the second out of the inning. Savage settled down and got out of the inning with another pop up, allowing just one Perry run. Savages better night of sleep Wednesday showed. He was sharp for the completion of the game Thursday. His slider buckled several Panther batters. He threw it for strikes, and he threw it often on the inside corner of the plate. Savage finished with one run, five hits  including two check-swing singles  and six strikeouts. Perry had opportunities, but it stranded six runners, and had two others thrown out trying to steal on strong-armed Tiger catcher Charles Hendricks. The Panthers also hit into one inning-ending double play. Massillon offense was not overpowering, but for an opposing team it can be torture. The Tigers scored two runs in the first and one each in the third, fifth and sixth innings. Todd Helline walked and went to second base on Dan Ackermans infield single. No. 3 hitter Chad Marceric attempted to bunt, and Perry third baseman Doug Hutchinson charged to field the bunt. Marceric pulled back, and Helline stole third base with no one covering. Helline scored Massillons first run on a throwing error. Ackerman came around to score on a sacrifice fly by Anthony Battle. The Tigers took a 2-1 lead. Massillon lead was extended to 3-1 before the shower started Wednesday. Chad Marceric came through with a one-out single to left field that scored Melito. In the fifth, Melito walked to start the inning. Helline, in perfect Massillon fashion, bunted him to second base. Ackerman then crushed a double to left field. The Tigers led 4-1, and Perry was down to it last six outs. That was not more true than Thursday. All you had to do was look at a father and son doing the little things Thursday night. They were off to the side, locked in a hug neither will forget for a long time. Yes, the little things are very important. When the Massillon Tigers take on the Dublin Coffman Shamrocks in a Canton Division I regional semifinal baseball game next Friday at Thurman Munson Stadium, theyll be running into a team that is tournament tested. Four Dublin Coffman starters were in the starting lineup a year ago when the Shamrocks fell to Toledo St. Francis in a regional final game. Ten players off that team dot the teams 2000 roster. Tim Saunders has been at the helm at Coffman for 13 seasons. His teams have reached regional play four times, including last springs "Elite Eight" squad. The Shamrocks have posted a 19-8 record this year, winning the Ohio Capital Conference Central Division title with a 9-1 league slate. One of those eight losses was a 4-3 decision to Perry, Massillons district championship game victim. Saunders says this years Coffman team has been swinging the bats extremely well in post-season play. "Weve scored a total of 45 runs in sectional-district play," Saunders reported Friday evening. "So we are putting up good numbers, although we havent faced any overpowering pitching yet. "Were a singles- and doubles-hitting team. Our goal is to hit the baseball squarely. We try to go gap to gap and see what happens." In fact, Coffmans leading home run hitter has collected the modest total of four round trippers this spring. On the mound, the Shamrocks are relying on a one-two pitching punch in post-season play. Both starters have posted 7-2 records this year and Saunders says he has equal confidence in either hurler, using one in relief of the other if the situation arises in the no-tomorrow format that is single-elimination baseball. "Neither one of our guys is overpowering," Saunders said. "They just go out there and throw strikes and our defense backs them up." Neither of Coffmans starting pitchers is a senior. There is junior left-hander Travis Taylor and a sophomore righty. "Actually, they complement each other well," Saunders revealed. "One throws the ball a little harder and the other has a nice off-speed pitch." Taylor throws the ball in the low 80 miles-per-hour range and Saunders classified him as a pitcher that may interest a Division III college program. "Travis is a winner, a great competitor," said Saunders. "He gets overlooked by the bigger programs because of his (lack of) velocity. "None of my seniors is getting and Division I look. That helps our team chemistry because there isnt any jealousy." Senior shortstop Jack Lucas carries the Shamrocks highest batting average. Hes hitting .435 this season. "We set team goals of getting 20 wins, winning a league title and getting to the district," Saunders said. "Weve achieved two of the three. From here well just take it game by game." Massillons Anthony Battle, sliding in safely at second base in a regular-season game at North Canton, is one of several players on the Tigers with ample varsity experience. The Massillon Tigers are one of 16 teams still in the running for the Division I baseball championship. Massillon, which has a regular-season matchup against GlenOak set for today at 4:30 at Schroeder Field, is part of the four-team Canton regional tournament field that includes upcoming post-season foe Dublin Coffman. The Canton regional is scheduled for Friday, with the 21-6 Tigers and 19-8 Shamrocks paired in the 5 p.m. contest, the second game of a doubleheader at Munson Stadium. The opener pits 14-12 Hudson against 22-5 New Philadelphia. "Our two teams appear to be evenly matched," said Massillon coach Tim Ridgley. "We havent seen them, but I have a lot of confidence in our kids. "We have a lot of experienced kids playing very well." New Philadelphia, which defeated Central Catholic 12-1 in a regular-season game at Munson Stadium on May 13 and lost 9-6 to Perry in an earlier matchup, is making its second straight trip to Canton for regional play. The other three Division I regional sites are at Solon, Elida and Wright State University in Dayton. All four regionals have scheduled doubleheaders on Friday. "Our regular-season schedule has had a lot to do with our success," Ridgley said. "This has been the toughest regular-season schedule weve played since Ive been at Massillon." Mansfield Madison, one of the new teams on Massillons regular-season schedule this spring, is still in the Division I tournament. Madison (23-6), which split a doubleheader against the Tigers at Schroeder Field on May 13, will meet Whitehouse Anthony Wayne in the second of two regional semifinal games at Elida. Ridgley, now in his seventh year as Massillon head coach, will be guiding his second team into regional play. The 1994 Tigers went on to win the Dover Division I regional, advancing to the state title game in Columbus, where they lost to Toledo Start. Start (19-0), a perennial Division I state power, also is one of the 16 teams left in regional competition. Start and Madison could tangle for the Elida regional title next Saturday. However, Start must get by Grove City (19-8) in a semifinal match up on Friday. Cincinnati Elder, which defeated Cuyahoga Falls for the 1999 Division I state championship at Munson Stadium, remains in the tournament field, competing in the Wright State regional. Elder (23-4) is scheduled to open regional play at 2 p.m. on Friday against Troy (15-9) with Cincinnati Moeller (21-4) opposing Miamisburg (23-6) in the second contest. The Solon regional has either Cleveland St. Ignatius or North Royalton meeting Brunswick (24-4) in the first game with Wadsworth (21-4) colliding with Euclid (21-6) in the second contest. St. Ignatius and North Royalton are slated to meet for a district championship today. Wadsworth eliminated 1999 Canton regional semifinalist Akron Garfield - another Massillon regular-season foe - in the Akron title game last week. Garfield had ousted Lake in the district semifinals. When Massillon met Perry last Thursday, it marked the third straight year two Stark County teams met for the district crown at Struthers. 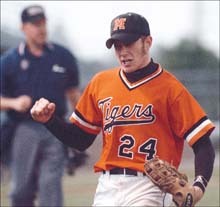 North Canton defeated Jackson for the 1999 district championship, eventually advancing to the state tournament where it lost in the semifinals to Cuyahoga Falls. In 1998, McKinley defeated GlenOak for the district championship at Struthers. Dan Brooks, the Canton Division I regional tournament manager, says an inquiry has been made on having the district tournament moved back to Stark County. "The state told us the reason they took the district out of (North Canton) three years ago was because we had the regional and two of the state tournament games," he said. "Well, the two state tournament games were moved back to Columbus, so maybe there is a chance we can get the district back in this area." Munson Stadium would be an ideal site, although that venue has been used for NCAA Division III tournament games around the same time as the district the past few years. Massillons tournament victories have been over GlenOak, 1999 state semifinalist North Canton Hoover, Howland and Perry. Not only did that 4-2 sectional first-round victory over GlenOak extend Massillons tournament run, one team member believes it fueled the teams confidence level. "Beating GlenOak was big because we know they have a great program, but we finally won a tournament game after losing our first game the past three years," said Massillon shortstop and pitcher Jason Savage. "We seemed to play a lot looser in our next three games." All Championships will be Saturday, 1 p.m.
Cle. St. Ignatius (22-5) vs. Brunswick (24-4), 2 p.m.
Wadsworth (21-4) vs. Euclid (21-6), 5 p.m.
Hudson (14-12) vs. New Philadelphia (22-5), 2 p.m.
Massillon Washington (21-6) vs. Dublin Coffman (19-8), 5 p.m.
Tol. Start (19-0) vs. Grove City (19-8), 2 p.m.
Mansfield Madison (23-6) vs. Whitehouse Anthony Wayne (20-3), 5 p.m.
Cin. Elder (23-4) vs. Troy (15-9), 2 p.m.
Miamisburg (23-6) vs. Cin. Moeller (21-4), 5 p.m.
Orrville (19-9) vs. Tallmadge (20-2), 2 p.m.
Canfield (17-6) vs. Chesterland W. Geauga (18-6), 5 p.m.
Olmsted Falls (19-5) vs. St. Marys Memorial (21-6), 2 p.m.
Cols. St. Charles (19-5) vs. Galion (22-6), 5 p.m.
Rayland Buckeye Local (18-9) vs. Washington C.H. (20-1), 12:30 p.m.
Steubenville (24-3) vs. South Point (17-6), 5 p.m.
Vandalia Butler (26-2) vs. Loveland (19-8), 2 p.m.
Cols. Watterson (21-5) vs. Cin. McNicholas (14-14), 5 p.m.
Leavittsburg LaBrae (16-4) vs. Cle. VASJ (18-4), 2 p.m.
Youngs. Ursuline (18-7) vs. Apple Creek Waynedale/Elyria Cath. winner, 5 p.m.
Louisville St. Thomas Aquinas (17-3) vs. Bellville Clear Fork (17-9), 2 p.m.
Genoa Area (24-3) vs. Coldwater (22-3), 5 p.m.
Heath (22-4) vs. Frankfort Adena (20-5), 2 p.m.
Wheelersburg (23-4) vs. Gnadenhutten Indian Valley (20-7), 5 p.m.
Granville (23-7) vs. Versailles (17-5), 2 p.m.
Bellefontaine Benjamin Logan (23-5) vs. Cin. Madeira (20-5), 5 p.m.
Fairport Harbor Harding (24-3) vs. Tiffin Calvert (15-8), 2 p.m.
Southington Chalker (21-5) vs. Independence (N/A), 5 p.m.
Defiance Ayersville (18-5) vs. Lima Perry (21-4), 2 p.m.
New Riegel (19-6) vs. Mt. Blanchard Riverdale (15-5), 5 p.m.
Berlin Hiland (16-11) vs. Racine Southern (10-17), 2 p.m.
Morral Ridgedale (16-8) vs. Leesburg Fairfield (17-6), 5 p.m.
St. Henry (19-6) vs. Middletown Fenwick (18-10), 2 p.m.
Cin. Country Day (19-6) vs. Fort Loramie (N/A), 5 p.m. 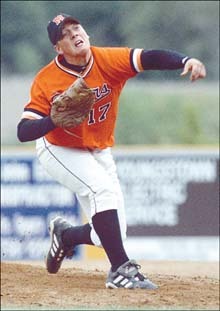 The first season Tim Ridgley coached the Massillon Tigers varsity baseball team, they went all the way to the Division I state championship game at Ohio State University. That was six springs ago. When Ridgley steps onto the field at Thurman Munson Stadium on Friday in a Canton Division I regional semifinal game against Dublin Coffman, there will be a distinctly different feel in the pit of his stomach than the one he had back in 1994. "I was the lucky guy that first year," admitted Ridgley prior to Mondays regular season game with GlenOak. "I was so fortunate to be associated with such a great team and such great people. I just guided the ship. They did the rest. "This team is more like our kids. Theyve been in the program, both the high school program and our summer program, for four years. Thats huge. "Ive invested a lot and so have they. So it does feel more like these are my kids than that great team my first year." The Orangeman summer program, in Ridgleys estimation, is a big reason the Tigers have come up big all season long. He points out the summer travel team philosophy, one that includes a 60-game schedule, worked long before he instituted it at Massillon. One local example is GlenOak, which posted back-to-back state baseball titles in 1995 and 1996 under head coach Joe Gilhousen. "I believe in my heart and soul that the No. 1 reason (the Tigers) are what they are is because of their families," Ridgley said, "and No. 2 is what theyve done in the summer program." One of the primary strengths of this edition of the Tigers is their pitching depth. Southpaws B.J. Budd, Jason Abbott and David Broome and right-hander Jason Savage have been outstanding in starting roles this season. They each had the opportunity to apply extensive polish to their skills through the Orangeman programs. Another impact of the Orangeman is the cohesiveness it fostered for this edition of the Tigers. "The reason these kids have gelled is because of that summer program," Ridgley said. "I think it has been phenomenal." Dublin Coffman, the Tigers regional semifinal opponent, has its players on an American Legion team during the summer months, playing a 30-35 game schedule, according to coach Tim Saunders. The Tigers dropped a 7-5 decision to visiting GlenOak in a regular-season matchup at Ducky Schroeder Field on Monday. Mike Beard belted a three-run home run in the top of the seventh inning, erasing a 5-4 Massillon lead. The Tigers, now 21-7, scored all five runs in the last of the sixth inning. Charles Hendricks and Jason Abbott had run-scoring singles, and Ryan Ridgley lifted a sacrifice fly, making it a 4-3 game. Dan Melito then gave Massillon its first and only lead with a two-run single. Tim Ridgley used everybody on the roster, including five pitchers. Junior left hander B.J. Budd, who will get the nod in Fridays regional semifinal against Dublin Coffman, worked the first three innings. "This game was a good tuneup for us," Ridgley said. Amucenal and Saunders. B.J. Budd, Chris Swenson (4), David Broome (5), Jason Abbott (6), Jim Barkan (7) and Charles Hendricks, Drew Feucht (6). WP - Amucenal. LP - Barkan (1-1). HR - (G) Beard, Saunders. MASSILLON  The partying is over. The Massillon Tiger baseball team had a long weekend. They were still coming down from their district championship on Friday. Prom was Saturday at Washington High School. And then there was the Senior All-Night party that lasted into the wee hours of Sunday morning. When daybreak came Sunday, the seniors were off to spend the day at Cedar Point. For obvious reasons, the baseball team had a little rust in a regular-season game against GlenOak on Monday. But not too much rust. The Tigers were down 4-0 and their dugout was unusually quiet. In the bottom of the sixth, Massillon scored five runs to take a lead going into the last inning. Mike Beard hit a three-run home run that gave GlenOak a 7-5 win over Massillon. No harm, no foul for the Tigers. The most important games  the only ones that matter this week  is a Division I regional semifinal game against Dublin Coffman at Thurman Munson Memorial Stadium on Friday and a possible regional final on Saturday. Massillon is two wins from making its first state tournament appearance since 1994. The GlenOak game was all about getting guys into the game and getting them some work, Massillon head coach Tim Ridgley said. We did all of those things. On the scoreboard, it said we lost, which Im not really concerned about and neither are our kids. It was like a city morgue on our side of the field. Massillon will play Dublin Coffman at 5 p.m. At 2, New Philadelphia and Hudson will meet each other. Coffman, however, is no pushover. The Shamrocks, who boast Anaheim Angels pitcher Kent Mercker as an alumnus, are not just lucky, either. They will bring a 19-8 record into Fridays game, two strong pitchers and a bruising lineup. Last year, they were knocked out of the tournament in the regional finals, and four players return from that team. Coffman has six hitters with batting averages at .375 or higher. It has scored 45 runs in four tournament games. In their district championship game, Coffman lost a 3-0 lead and trailed 4-3 in the third inning. The Shamrocks ended up winning in five innings thanks to the 10-run rule, which means they put their opponent to shame. The teams best hitter is Jay Eastway, who will bat either fourth or fifth in the order. He is hitting .455 and leads the team in home runs. Massillon has a lineup just as potent. The Tigers scored five runs, almost with ease, Monday. More often than not, the team that makes it to the state tournament has two solid pitchers. Massillon Left-hander B.J. Budd and righty Jason Savage have proven their abilities by winning pressure-packed tournament game thus far. We think we have two No. 1s, Saunders said. Left-hander Travis Thomas is the smaller of the two, and less overpowering, but he throws sharp breaking pitches. He is 5-foot-9, 150 pounds and has a 7-2 record. In the district finals, Thomas, a junior, struggled with his location and gave up two home runs. He was removed in the third inning of the game the Shamrocks eventually won by more than 10 runs. Right-hander Brock Hunton came on in relief to get the win. He, too, is 7-2. He is 6-2, 170, but just a sophomore. The Tigers should know they will be getting a team solid on fundamentals, and an opposing coach with an impressive resume. Saunders has been the head coach at Coffman for 13 seasons. Prior to that, he served as an assistant coach in the Big Ten with Indiana University. He serves as the head coach for the 16-year-old USA Baseball Summer League team that travels the country. Most coaches spent two years in that role, but Saunders has been asked to stay on for five straight seasons. One thing that sets the Massillon baseball team apart from other high school ball clubs in Stark County - other than the fact the Tigers are still in the hunt for a state championship with a Canton Division I regional semifinal tilt set for Friday at 5 p.m. at Munson Stadium - is their bench jockeying. Being a bench jockey used to be a big part of the game of baseball. A player who was not in the starting lineup felt as if he was helping the team out by being a vociferous presence while sitting on the pines. Most of the time that meant shouting out encouragement to his teammates. But an effective bench jockey would also attempt to get under an opponents skin in the hopes of distracting his foe or causing him to lose focus. He would needle. He would chirp. He would belittle an opponents ability ..all in the cause of helping his own team. While directing comments from the bench at an opposing teams players has been outlawed in high school baseball, the Tigers have the areas loudest, most energetic dugout, shouting and chanting from the first pitch to the final out in most games. Tiger coach Tim Ridgley didnt encourage this sometimes-irritating approach to the game but he is glad his charges have adopted it. "Every team you have takes on the personality of the kids who are on that team," Ridgley said. "They feed off of certain things, whether it be performance, the dugout, or both. "These guys started with this thing. Ive been careful with it. I dont care as long as we say things to our kids." Ridgley stressed that Ohio High School Athletic Association rules state a player cannot say anything to the opposing team or an opposing teams player. That issue came up during the district finals against Perry. "The only thing I want to see is us win," Ridgley said. "Im not going to put my foot down and stop something our guys feel is important to get them energized to win. "I have stepped on them at certain times about watching what they say to make sure the other team doesnt think it is directed toward them." Ridgley admits bench jockeying isnt what it used to be when he was an active player. "Part of it is part of the game," Ridgley said. "Things are said during the game and our kids get energized by it." While Ridgley embraces the Tigers vocal approach to the game, he acknowledges it hasnt been a staple of his baseball program at Massillon. Prior to this year, the Tigers were a more passive group when in the dugout or on the bench. "It was like pulling teeth to get them fired up on the bench," Ridgley said. "Because of this team, our junior varsity and freshmen have picked up on it. "Its kind of like hitting. Hitting can be contagious. Winning can be contagious. This has been contagious, and now our freshmen and JVs are doing it, too." l When a Massillon player draws a walk, the players will chant, "Go. Go. Go," as the batter jogs down the first base line. Then when the player reaches first base, they shout, in unison, "Stop!" l When a Tiger base runner is leading off and the pitcher throws to the base, the team shouts, "Back!" Once the fielder throws the baseball back to the pitcher, the team will yell, "Clear." l One of the more creative chants comes when starting shortstop Dan Melito walks to the plate. The players will give a Wizard of Oz-like chant, "Muh-lee-tow, oh-oh. Muh-lee-tow, oh-oh." Anthony Battle is one of the Tigers more active bench jockeys but Jason Savage may be the loudest and most creative, says Ridgley. Another who makes a lot of noise is injured starting pitcher Jason Weick, who has refused to allow a season-ending injury diminish his enthusiasm for the game of baseball. Ridgley says this seasons Tigers do more bench jockeying than any team since he has been in charge of the program. The last thing his charges worry about is firing up the other team. "If that happens, we go another notch above them," Ridgley said. "They kind of thrive if the other team gets on it, too." There are those who dont like Massillons vocal approach. Some say it can lead to hard feelings or even physical confrontation. Ridgley doesnt subscribe to that theory. "Isnt it a kids game," he said. "Thats what its about. "Some people might take offense to it. But the bottom line at this level is to win. Its my job to make sure we have that opportunity and if this enters into it, were going to do it no matter what anybody says." NOTEBOOK: The Tigers will not play another regular season game this week to prepare for their regional semifinal contest against Dublin Coffman, Friday at 5 p.m. at Thurman Munson Stadium. ..Massillon may well square off against its own junior varsity team, which went 23-2 this season. "Those guys have running their lips a little bit," Ridgley said of his JV squad. "Ive had (varsity) guys ask me, Lets play them. We want to play. We might do it on Thursday." ..Weick, who had a fine junior campaign for the Tigers and was very promising in the summer and fall leagues, hasnt pitched in a game this season due to a torn pectoral muscle in the front of his right shoulder. Ridgley says Weick hasnt missed one game this season and will coach one of the Orangeman teams this summer. ..Dublin Coffman and Massillon take a similar approach on offense. Both teams feature gap hitters who shoot for singles and doubles rather than the fences. But Massillon has far better team speed than Coffman and uses it to an advantage on the basepaths. ..Battle and Savage rank one-two in stolen bases for Massillon. It has been almost six years. Tim Ridgley never will forget the day. At the time, he was the first-year head coach of the Massillon Tigers. Ridgley and his team were on the floor for the last song of the season. He was looking into the sunny, blue skies above Bill Davis Stadium on the Ohio State University campus. The view of the days beauty was murky. Ridgley led Massillon to the state high school tournament. And the Tigers lost to a loaded Toledo Start team, 10-2, for the Division I state title. It came to a screeching halt. But the story of Tim Ridgley starts there. To know Tim Ridgley is not to watch him in the third-base coachs box during a game. The guy in the box is the facade Ridgley puts up every day. He is all business. The guy his players eventually come to know has a big heart. He cries when a song on the radio tugs at his heart. Who is Tim Ridgley? He is a guy who wears Oakley sunglasses, but not around his eyes. He used to hide his eyes with them. Now, they just rest atop his ball cap, usually upside down. He is a man who knows the exact decibel level in which waves off the ocean come ashore. He simulates the decibel level with music everyday to relax himself. Before a baseball game, when Ridgley is standing next to his players along one of the foul lines during the National Anthem, he is not thinking about the game. At least not at that particular time. He is thinking about his father, Spike Ridgley. Their time together was cut short. Maybe that is why Tim Ridgley is so profoundly aware of how short his time with the players is. Spike Ridgley was a World War II veteran. He played minor league baseball for the Zanesville Indians and later became one of the toughest outs in the Canton Class A League. His first year out of the University of Wyoming, Tim Ridgley lost his father. Spike was just 51 and working at Republic Steel. He helped me a lot just in life in general, Ridgley said. Ridgley is not looking forward to the end of the season. It is a year that he has developed a special bond with the players. One of the unfortunate things about our profession is that a lot of times kids dont see the real person behind the uniform, Ridgley said. When I wake up in the morning, I put on my dad and husband hat. I walk out the door for work, and I put on my teacher hat. I go to practice, and I put on my coaching hat. But rarely in front of a stranger does Tim Ridgley cry. He could not help himself six years ago. That year, he took a group of kids farther than anyone  including themselves  thought possible. The team went to Tennessee that year for a spring trip. While in the capital of country music, the entire team was hooked on the sound. We just started listening to it and never let it go, Ridgley said. The entire Massillon community backed the baseball team the same way it does the football team. It was a boost the program needed. It raised community pride another notch. All in his first season. I was lucky here, Ridgley said. I was the one who got to direct the team. Everything we needed was already intact. From that point, though, the program took off. For the first two years, I was also an assistant football coach, but baseball just got too big, too soon. Losing, though, hurt. And there never has been a medicine for the pain. Until  possibly  now. Last week, this years team was riding back to Massillon. A district championship was in their hands and a spot in the regional semifinals was guaranteed. The Tigers will play Dublin Coffman at Thurman Munson Memorial Stadium Friday at 5 p.m.
A player from this years team, Dan Melito, made a CD. He played it on the bus ride home. This is the tough guy, the hard guy, the all-business guy fans see on the field. And he is not afraid to admit he had tears in his eye when The Dance started to play. Many interpret it as a love song. To Tim Ridgley, and his team, it is a baseball song. It is theirs from 1994. Whenever I hear that song on the radio, the first thing I think of is that team, he said. Yes, the 1994 team still holds a place in Ridgleys heart. The team is still the subject of much community talk. Even moreso now that this years team is two wins from making another dance to Columbus. The players on that team gave fans a hint of what they would become as young men. They are finished with college. Geoff Merchant, an infielder, scored a 32 out of a possible 36 on his ACT. He works on Wall Street. Dan Seimetz broke most of the schools batting titles. He was baseball. He broke records at Ohio State. He was drafted by the Yankees  twice. Both times Seimetz turned them down because he was not finished with his education. An injury cut short his playing career. But he is a successful businessman in Columbus. B.J. Payne was a power-hitting third baseman. He was fun and always full of surprises. He had a bit of a wild side, but a good-natured one. He is a professional wrestler. Shortstop Mike Utterback was a by-the-book kid, staying out of trouble. In fact, he was almost too perfect. He works for the U.S. government in Washington, D.C.
That was a special group, Ridgley said. When we got beat in the state title game, I couldnt even talk to them after the game. I wanted to, but I couldnt physically do it. The players have been replaced, and so has the theme song. A bond is growing in Massillon. The fans and the coaches are falling in love with this team. They are surviving on the baseball field in Massillon. Game by game, week by week. The head coach has changed, too. Tim Ridgley is maturing. He is letting his heart show a little more. He wants his players to know a couple of things. He has changed a lot since 1994. Ridgley used to run a practice like a drill sergeant. He played under Bob Commings at Massillon and coached under him at GlenOak. He was, and in some ways still is, a Commings disciple. In the first tournament game against GlenOak this season, one of the hardest things I had to do was get them together, look at them with a big smile and say, Lets go have some fun. Thats not me, Ridgley said. But, then again, Tim Ridgley is still learning who he really is. He is taking the lead on the floor, albeit quietly. His players are following his steps. And theyre still in The Dance. The radio was blaring the music of hard rockers Golden Earring over the loudspeakers at Ducky Schroeder Field Thursday afternoon as the Massillon Tigers worked out under blue skies and abundantsunshine in preparation for todays Canton Division I regional semifinal game against Dublin Coffman at Munson Stadium. The Tigers, 21-7 after last weeks district tournament victories over Warren Howland and Perry, were a loose team on Thursday, enjoying the weather, the music, each others company and the workout the coaching staff was putting them through. After getting past the tournament opener, Massillon mentor Tim Ridgley has made a conscious effort to lighten up on the reins a little during this post-season run. "Its that time of the year you have to let them play and be loose," Ridgley said. "You dont want to inflict pressure on them too soon because theyll put plenty of pressure on themselves tomorrow to win the game. "We dont talk about it. We have fun, kid with each other, listen to some music and get done what we need to get done. Weve had a real good practice out here today." Thats not to say Ridgley has let the inmates run the asylum. Senior third baseman Chad Marceric says everyone still knows who is boss and everyone is still extending themselves for the finish line. "Hes still pushing us hard," insisted Marceric. "Hes got to. You got to keep us up. You cant relax at all. Weve got to keep going hard until its over ..until we win it all." The Tigers have gone where no Massillon baseball team has gone since the 1994 squad went all the way to the state finals. While the coaching staff is looking to keep things on the relaxed side, the pressure of playing for the right to be in the state finals is a fact of life with which the players have to contend. Of course, many of these same athletes were dealing with the pressure of post-season football play six months ago. There are similarities and differences. "I feel more confident now," said Tiger clean-up hitter Anthony Battle. "There was more on the line in football with the perfect season and everything. Were all starting to come together in baseball and I feel more confident." "The butterflies were all gone after that first (tournament) game," said Massillon catcher Charles Hendricks. "Were just playing for fun now and were just out to get the job done." Hendricks, a senior, will be on the receiving end of the offerings of starting pitcher B.J. Budd this afternoon. He says the junior left-hander is not the easiest hurler on the team to handle. "B.J. has like eight different pitches," Hendricks said. "He can come from a variety of different arm slots. He changes speeds a lot. He has his own personality on the mound. Hes a lot different than a lot of other pitchers. Sometimes he starts rushing himself and you have to slow him down." Budd was dominant in the 7-0 district semifinal victory over Warren Howland. Munson Stadium has a very large playing field. The outfield fences are major league dimensions. In short, it is a pitchers ball park. By contrast, there is a lot of ground for the Tiger outfielders to cover, especially against a gap-hitting team such as Coffman. "The size of the outfield doesnt matter," insisted Tiger senior right fielder Dan Ackerman. "Its like Coach Ridgley says, Big players make big plays in big games."
Although he hits in the two-hole, Ackerman confided that his primary focus in a game of this magnitude is to be solid with the glove. "We have enough guys who can do the job offensively," he said. "If I can get a hit here or there, score a run, steal a base or whatever helps the team out, thats great. But its mainly defense for me." Todd Helline hits just in front of Ackerman, in the leadoff spot. And like Ackerman, Helline is a senior facing the end of his high school baseball career with each game. He wont soon forget the camaraderie he enjoyed. "Were like a bunch of brothers out here playing together," Helline explained. "Every game could be our last game playing together, so we have to go out and win so we can keep playing." In order for that to happen, the Tigers will have to beat a regional tournament-tested Dublin Coffman squad. The teams are similar in that they dont boast a lineup full of long ball hitters, instead preferring to find the gaps for singles and doubles. However, the Tigers apparently have a significant edge in team speed and that could come into play on Munsons spacious playing field. "We hit the ball in the gaps and we have some kids who can run," acknowledged Ridgley. "Im not going to change our philosophy for this game. "Theres going to be certain situations where Im going to make them throw us out. Being a big field like it is could help us out." But win or lose, Ridgley wants to make sure his young charges soak it all in. He wants them to take a moment to reflect on what they are experiencing and to realize all they have accomplished this spring. "There are only 16 teams left in the state and were one of them," Ridgley said. "I can remember back when I played football here and that was an exciting time. Then we (play for the state title) in 1994 and it wiped that memory out, and if we do it again this year Im sure this memory will wipe that other memory out. "Athletes do live their lives in the past a little bit. They reminisce and talk about what they did in high school or college or whatever. So it is a real important time for the kids and our program." And if the Tigers have it their way, this "time" will continue into next week with a final four berth in Columbus. A nightmarish first inning, during which Dublin Coffman batted around, left Massillon with a deficit it couldnt close as the Tigers dropped a 10-3 Canton Division I regional semifinal game to the Shamrocks in front of an estimated 1,500 fans at Thurman Munson Stadium, Friday afternoon. Coffman tallied five runs on four hits in that opening frame. Seven of the first eight Shamrock batters reached base. It was like a dream come true for Coffman head coach Tim Saunders. "Right after the Star Spangled Banner I told one of our coaches that it would be nice to get six runs right off the bat, and we got five," Saunders revealed after the game. "Massillon competed and they kept going but that was a great start for us and now our kids really believe in themselves." Coffman came into the game averaging over 10 runs a game in sectional and district tournament play and the Shamrocks kept up that pace against Tiger starter B.J. Budd. But Massillon hurt itself, issuing three walks (one intentional) in the decisive first inning. "B.J. wasnt throwing well," Ridgley said. "He was sick. You get the ball up and theyre going to hit it all over the ballpark on you and thats what they did." Jack Lucas led the game off for Coffman with a line shot single to center field and two-hole hitter Travis Thomas walked on four pitches. Jay Eastway bunted the runners over to second and third and Ridgley had Budd issue clean-up hitter Bart Hunton an intentional walk to load the bases and set up a force play at any bag. But Coffmans Marc Crabtree ruined the strategy by blooping a single into short left field to bring home Lucas. Another walk plated Thomas with the Shamrocks second run and Brock Hunton drove a ball over the outstretched glove of right fielder Dan Ackerman to score his brother Bart and it was a 3-0 game. Brad Krause followed with a sharp single to left to bring Crabtree around and Andy Yates hit into a fielders choice that scored Martin to make it 5-0. It couldve been worse if not for a fine diving stop on the play by Tigers first baseman Anthony Battle, who got to his knees in time to get a force out at second base. The damage had been done, however, and Massillon was in a deep hole early. "B.J.s pitches were up and he struggled," explained Ridgley. "He couldnt get his curveball across in the first inning and when he cant get his curveball across, hes in trouble." Despite the deficit, Ridgley was confident the Tigers could come back. He has seen his team do just that time after time this season and there was no reason to believe they couldnt do it again. "I dont ever wonder about these kids," he said. "I told our juniors if you learn one thing from the senior class, it is never to give up. This is a heck of a group of kids." Todd Helline led off Massillons first with a single to left-center field. With Ackerman up, Helline got the steal sign and took off, only to be gunned down at second base by Bart Hunton. "I had reports on how good of a catcher he was and I wanted to see," said Ridgley. "He has a cannon. He has a cannon. But you want to stay in your game plan." Despite the score, Saunders wasnt surprised to see Helline take off. "Weve heard theyve been doing that," Saunders said. "Thats what wins them games. "If youve watched our catcher throw, any major college coach is going to say that kid can play. If they go, we invite them to go." Coffman added a run in the second on a one-out walk, an infield hit, a single and a sacrifice fly. It appeared Massillon got on the board in the bottom of the second, but Charles Hendricks was called out at home plate on Ryan Ridgleys single to right field. Hendricks feet clearly slid across home plate before the tag but the umpire saw it differently. Helline walked with one out in the third, took second on a wild pitch and tallied the Tigers first run on Chad Marcerics RBI single to left. Coffman added two in the fourth on an RBI triple by Eastway and Bart Huntons sacrifice fly to push Massillons deficit to 8-1. The Shamrocks got two more in the fifth and left the bases loaded on a check swing strike three for the third out. But the Tigers now trailed 10-1. Thomas, a junior lefty, kept Massillon at bay until the seventh when Helline and Ackerman singled to lead off the inning. Tyler Armbruster was summoned from the Coffman bullpen and was greeted by a Marceric single. Helline scored on the play on a wild throw from the right fielder. Battle lifted a sacrifice fly to right to bring in Ackerman but thats as far as the rally would go. "We had 11 hits and they had 11 hits but that first inning killed us," Ridgley said. "Youve got to give credit to that ball club in the green. They hit the heck out of the ball." Coffman is scheduled to play Hudson this afternoon at 1 at Munson for the regional title. The Explorers edged New Philadelphia 3-2 in Fridays first game. Massillon finishes the season at 21-8. E-Bart Hunton, Melito, Brock Hunton, Stahl. LOB-Coffman 10, Massillon 10. 2B-Eastway. 3B-Eastway. CS-Helline. S-Eastway. CANTON  It was 5:10 in the afternoon Friday. The division I regional semifinal game between Massillon and Dublin Coffman had just started. Less than 15 minutes later, it was all but over. Coffman loaded the bases with one out in the first inning. The Shamrocks followed with three singles and a walk. They sent 10 batters to the plate in the first inning and jumped out to a 5-0 lead. It did not take the Tigers out of the game as much as it put Coffman in it  for good. The Shamrocks scored runs in four different innings and beat Massillon 10-3 Friday night at Thurman Munson Memorial Stadium. It ended the Tigers (21-8) hopes of making it to the state finals for the second time under head coach Tim Ridgley. Massillon started junior left-hander B.J. Budd. The Tigers had rode him to this point in the season, but Budd has a cold this week and was not feeling 100 percent before Fridays game, according to Ridgley. In addition to its 11 hits, Dublin Coffman batters drew seven walks. Massillon was able to muster just two free passes. The Tigers left 10 men on base, and had three others picked off, caught stealing and out trying to get an extra base. Ridgley stayed with his game plan for the first couple of innings despite being down 6-0 in the second inning. That plan was to run, bunt and put pressure on the Coffman defense. It is how the Tigers got this far. In the first inning, Massillon lead-off hitter Todd Helline reached on a single. He tried to steal second, but Shamrock catcher Bart Huntons throw was in plenty of time and on target. Massillon had runners on base every inning. The Tigers finally got a run cross the plate when Helline scored on a two-out single by Chad Marceric. By that time, Coffman led 6-1. Eight of Coffmans nine batters had at least one hit. They are averaging 10 runs per game in tournament play and hitting well over .400 as a team in the tournament. The Shamrocks will play Hudson (15-12) at 11 a.m. today at Munson. The winner advances to the state semifinals in Columbus. In the bottom of the seventh, Massillon was down to its last three outs. This is a Tiger team that has 10 last-bat wins this year. Helline, Dan Ackerman and Marceric started the seventh with three consecutive singles. Helline scored the Tigers second run of the game on a throwing error from the outfield. Ackerman scored on Anthony Battles sacrifice fly. And after they were in a hole, they continued to battle. The hole was just too deep.